A viewer exposes her boss for saying he would fire her if she were to become pregnant. Money flew out of the back of an armored truck on a New Jersey highway, causing chaos as some drivers tried to grab the cash. Adam Kuperstein reports. An armored truck rained money onto a New Jersey highway Thursday morning, causing two crashes as drivers attempted to collect the cash scattered across several lanes. Videos posted on social media show a Brink’s truck parked on the side of Route 3 in East Rutherford as one armored truck driver desperately tried to collect the cash on the road. Police said one of the truck's doors may have malfunctioned and become unsecured shortly before 8:30 a.m.
"The driver seemed to be both kind of laughing and crying at the same time, and he was kind of running around, telling people to stop," said Betsy Richards, who witnessed the cash grab as she commuted into the city on a bus. It's not clear how much money spilled out, but Richards said it appeared to be a lot. 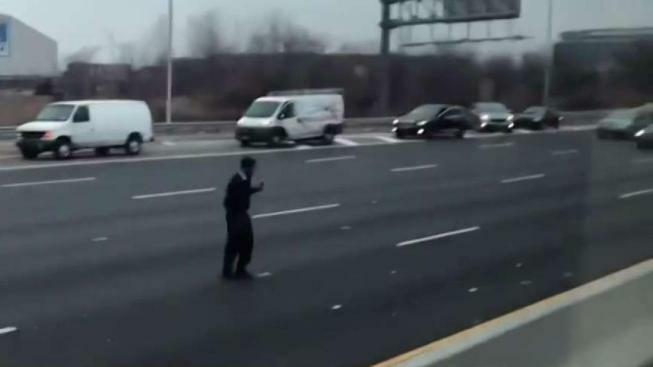 An armored truck rained money onto a New Jersey highway Thursday morning, scattering cash across several lanes of traffic. "I did see $100 bills, and 5's and 10's and 50's, so it was at least $10,000 on the highway," said Richards. Drivers leaving their vehicles to pick up the cash caused two accidents, police said. In one video, a person can be seen attempting to collect some of the currency from the roadway. News 4 on the scene even captured one man who lives nearby wandering on the side of the highway hours later, casually perusing the field. "Nah, there's nothing over here," the man later told News 4, laughing. "They took it all, guys." While witnesses got quite a kick out of watching drivers scrambling to pick up the cash -- like a game of Frogger in between moving traffic -- police are reminding the public it's theft. Anyone who collected money in connection with the spill is urged to call the East Rutherford Police Department at 2-1438-0165 "to make arrangements for its return with no charges filed." As of Thursday afternoon, police said several people had contacted the department in an attempt to locate money they had found on the highway. Brinks "provides U.S. and global security services including secure logistics, cash management, payment and retail back office solutions," according to its website. A vice president for the company said he could "confirm that there was an incident with one of our trucks this morning which we are investigating," without elaborating.